Guitar Rig 4 is available with or without the Rig Kontrol hardware. PRESS RELEASE: Native Instruments today announced GUITAR RIG 4 PRO, the next generation of its acclaimed guitar studio. The fourth version raises the bar on sonic authenticity with advanced new speaker emulation technology, and further expands on nearly all aspects that sets GUITAR RIG apart as the most capable digital guitar solution. To bring the acclaimed authenticity of GUITAR RIG to the next level, the new version introduces advanced cabinet and microphone modeling, providing an enhanced organic tone based on latency-free convolution technology. The advanced speaker emulation is also the basis for the versatile new "Control Room" module, developed in collaboration with leading German studio guitarist and recording expert Peter Weihe. This new module allows users to freely mix and match up to eight phase-aligned studio microphones for each cabinet, allowing an unlimited range of high-end studio recording tones. To further expand its comprehensive arsenal of carefully modeled amplifiers, GUITAR RIG 4 PRO offers two additional tube amp models that include the hot-rodded "Hot Plex" and the energetic "Jump", both based on Native Instruments' sophisticated Dynamic Tube Response technology. The comprehensive arsenal of effects in GUITAR RIG is complemented with two new delay units and two new flavors of reverb, bringing the overall number of included effects to 48. Musicians who use GUITAR RIG for live performance benefit from the new, dedicated master effects section, which enables popular stage configurations that can now include global equalizers as well as overlapping delays and reverbs. For recording purposes, GUITAR RIG 4 PRO also introduces true-stereo processing across the whole signal chain, which greatly accommodates the usage of the software as a universal effect unit for stereo signals. To give guitarists easy access to the right tones for every musical context, GUITAR RIG 4 PRO introduces a completely overhauled preset browser with many usability optimizations. With a new layout, faster and more efficient search functions, flexible attributes, convenient sorting and full compatibility with the KoreSound(TM) format from Native Instruments' acclaimed KORE 2, even large collections of tones can be managed in an especially convenient way. To provide users with a versatile sonic arsenal right from the start, GUITAR RIG 4 PRO includes a pre-categorized and conveniently tagged arsenal of more than 250 ready-to-play guitar sounds for a wide range of musical styles. Further improvements in GUITAR RIG 4 PRO include optimized sound quality for pitch-based effect modules, expanded host automation and controller assignment features, universal MIDI control functionality for the Rig Kontrol 3 pedal board, and more. 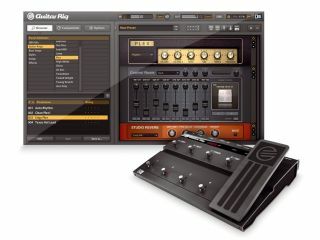 GUITAR RIG 4 PRO will be available in October 2009 in various versions to accommodate guitarists and producers of all categories. The GUITAR RIG 4 PRO software will be available for a suggested retail price of $199 / 179 EUR, and will also be part of the new KOMPLETE 6 bundle. Further versions of GUITAR RIG 4 include GUITAR RIG KONTROL with included foot controller/audio interface (£330/$449/399 EUR), GUITAR RIG 4 ESSENTIAL as a more affordable software version with a reduced feature set ($99 / 89 EUR), GUITAR RIG SESSION which combines GUITAR RIG 4 ESSENTIAL with the SESSION I/O audio interface ($249 / 229 EUR), and GUITAR RIG MOBILE which now also includes the mid-range GUITAR RIG ESSENTIAL software ($119 / 99 EUR).